In the distillation of binary mixtures, the minimum reflux ratio is given by the operating line which joins the product-composition to the point where the q-line cuts the equilibrium curve. 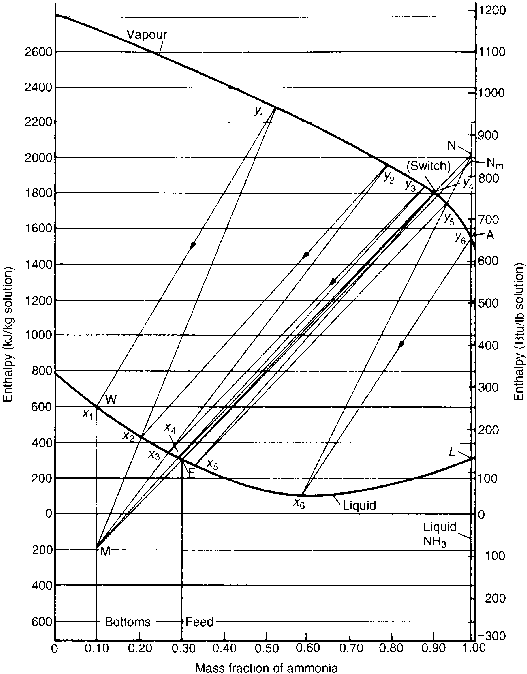 Thus, if Figure 11.40 represents the McCabe-Thiele diagram for a binary mixture of the two key components of a multicomponent mixture, then DF and WF give the minimum reflux ratios for the rectifying and stripping sections respectively. Moving along these operating lines, the change in composition on adjacent plates becomes less and less until it becomes negligible at the feed plate. At F the compositions are said to be "pinched". 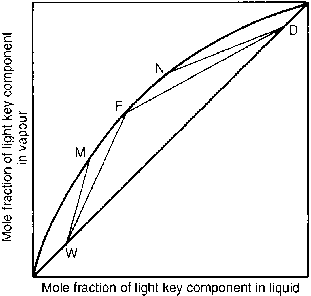 (a) If there are no components lighter than the light key, then all of the components appear in the bottoms and the pinch in the stripping section will be near the feed plate. (b) If there are no components heavier than the heavy key, then all of the components will appear in the top and the upper pinch is also at the feed plate. If both of these conditions are true, then the two pinches coincide at the feed plate, as for a binary system. For the general case, a number of proposals have been made for locating the pinched regions and hence the minimum reflux ratio Rm. Of these, the methods of Colburn and Underwood are considered. It may be noted that between the feed plate and the enriching pinch, the concentrations of components heavier than the heavy key fall off rapidly, so that the upper pinch may be regarded as containing the heaviest key and lighter components. Similarly the lower pinch has the lightest key and heavier components.